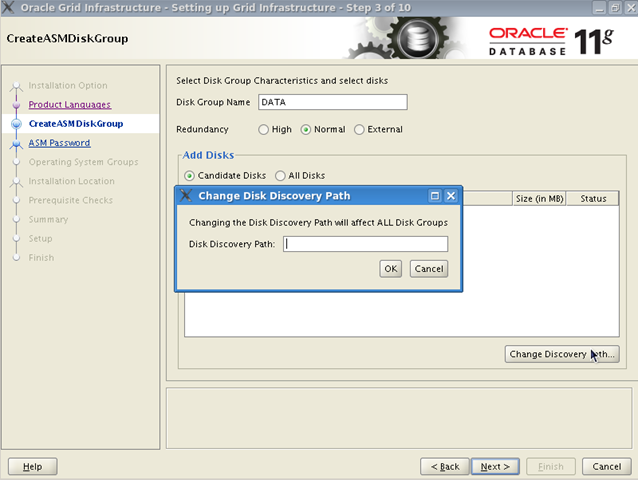 In Oracle 11g Release 2 you will find that things have changed even for single instance database installation. 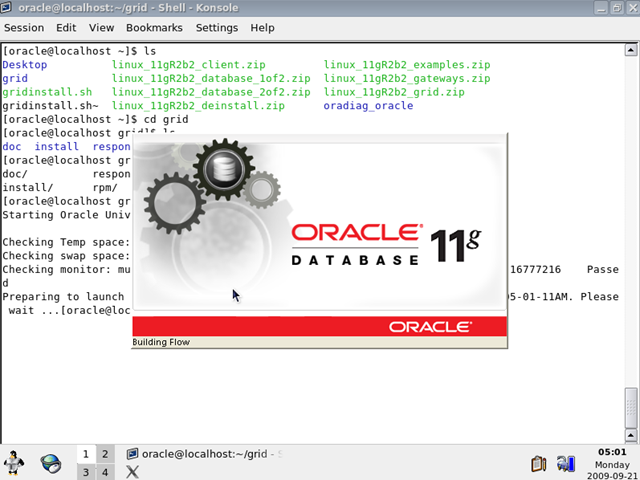 I will try to illustrate in this series of posts how to install a single instance Oracle 11g Release 2 database to your Linux machines. As the first part of our installation series, we will start by installing brand new Grid Infrastructure which you might think to be a fancy name for CRS+ASM but you will find out later that it is a bit more. 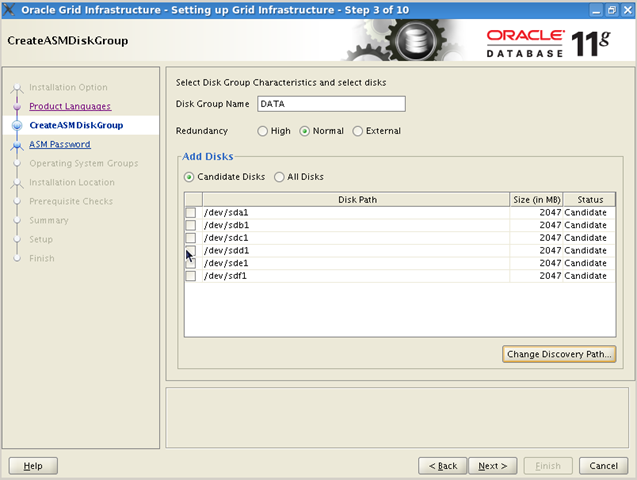 Memory 512MB Although minimum memory requirement for Oracle 11g Release 2 in a real production environment is documented to be 1024M, for all practical requirements of your playground 512MB will be sufficient. ASM Disks 6x2GB SCSI Disks We will be doing an ASM based installation so 6 disks over SCSI interface will be enough to simulate a real life experience with ASM. 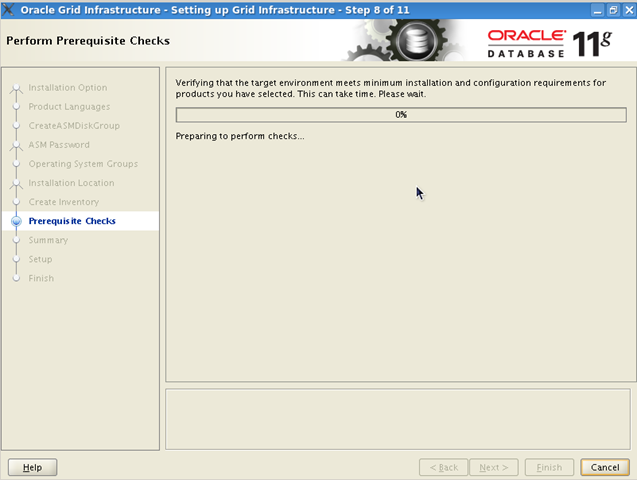 You are now ready to start your VirtualBox for Oracle 11g Release 2 installation. 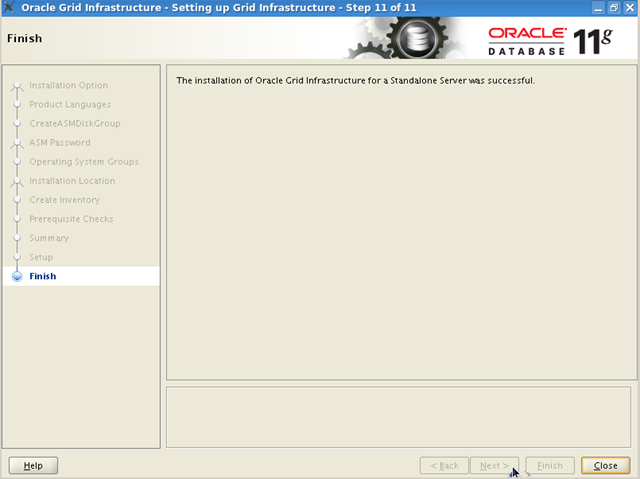 There are a few important tasks in OS level we should complete before starting grid infrastructure installation. The first thing is to create physical partitions over your virtual SCSI devices. Actually this is not crucial for ASM installation because ASM can use physical disk as a whole without any partition. However if you wish to create ASMLIB you will need those partitions. Physical partitions we have created are owned by root. They should be changed to be owned by ASM user (oracle in our case) in order to make them visible for ASM discovery. You should ensure that /dev/shm is minimum 256MB for a successful ASM installation (and 512-750M for RDBMS installation) with MEMORY_TARGET parameter. Notice that although we have VirtualBox instance with 512M memory, Linux allows us to mount tempfs with a size of 750M. This most probably due to lazy allocation of memory over tempfs. 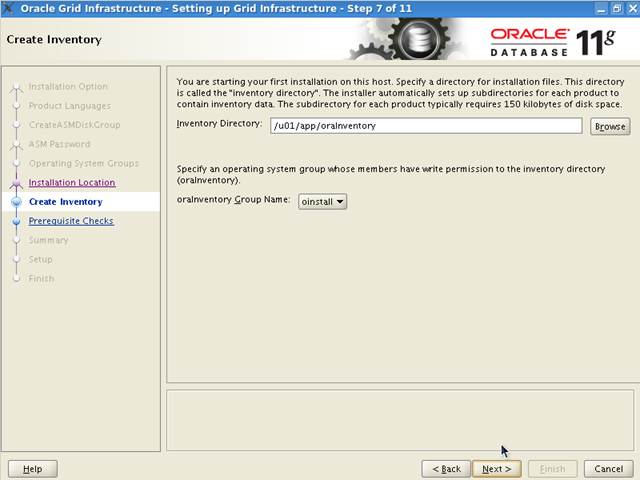 Final step is to create our software directory and set the required ownership to it. 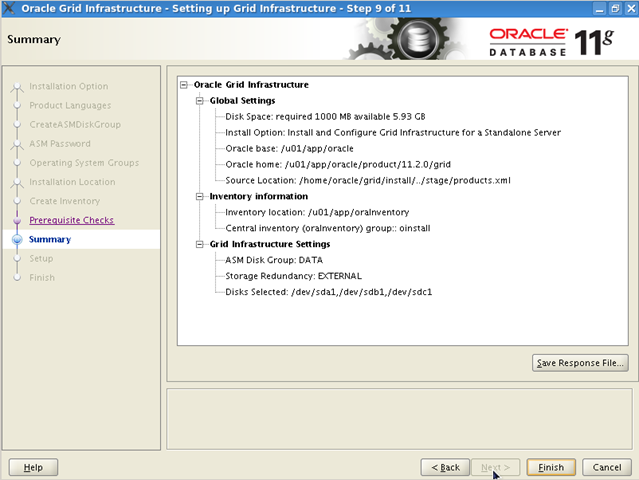 Choose Install and Configure Grid Infrastructure for a Standalone Server option and click on Next > button. 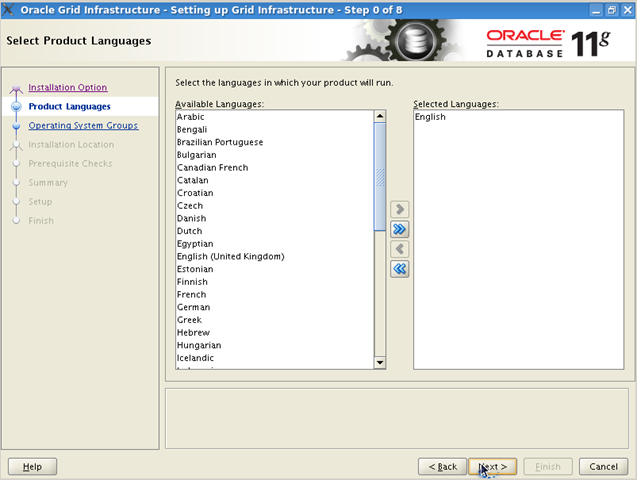 Set Selected Language language to English and click on Next > button. 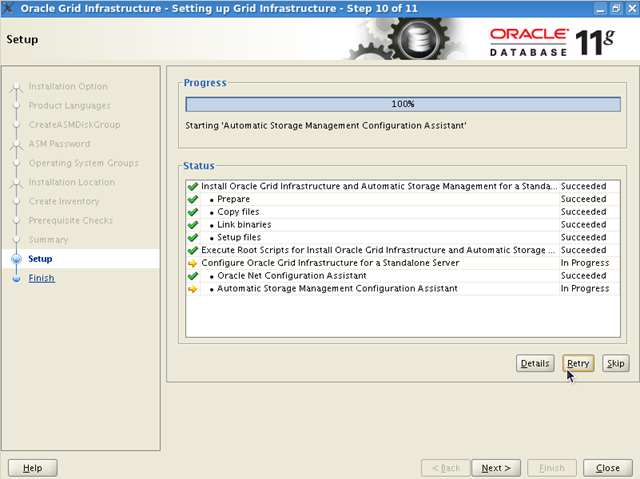 Next step is to perform ASM configuration for your grid. 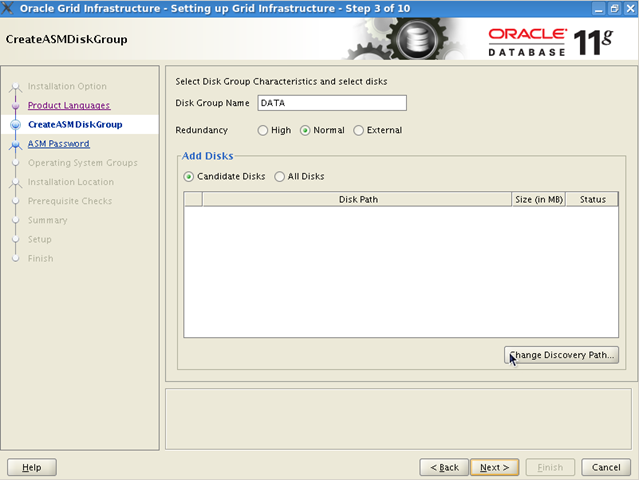 Choose External as the redundancy of DATA diskgroup. Now click on Change Discovery Path… button to define asm_diskstring parameter. Since /dev/sd?1 matches all six SCSI partitions and they are not members of any other diskgroup, installer will list all of them as Candidate disks.Check-out /dev/sda1,/dev/sdb1,/dev/sdc1 devices as members disks of DATA diskgroup then click on Next >Other disks will be used for Flash Recovery Area later on. 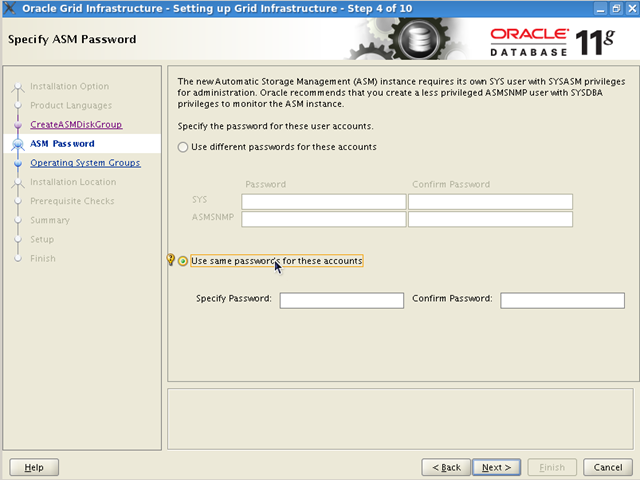 Choose Use same passwords for these account for a simple configuration then set Specify Password and Confirm Password fields to same password strings and click on Next >.I will be using sysadm throughout the post for any Oracle password required. One of the security enhancements introduced in Release 2 is the separation of different levels of ASM access. 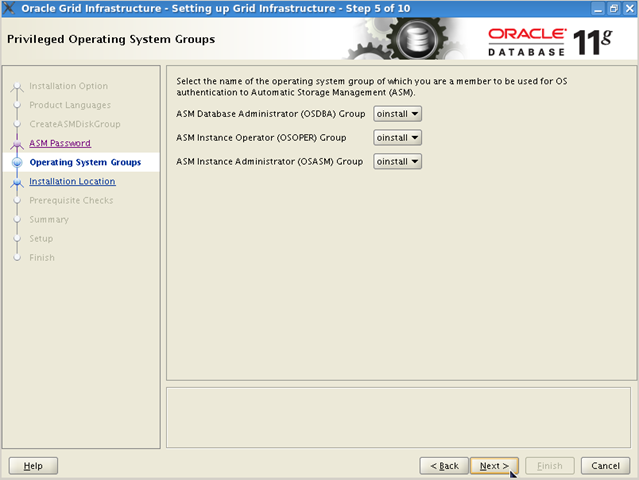 This defines different roles for “Who can start/stop ASM instance ?”, “Who can add/drop disks to/from diskgroups?” or “Who can use those diskgroups at RDBMS level ?”For the simplicity of installation we will be setting all roles to dba group.Now set all three select lists to dba and click on Next >. 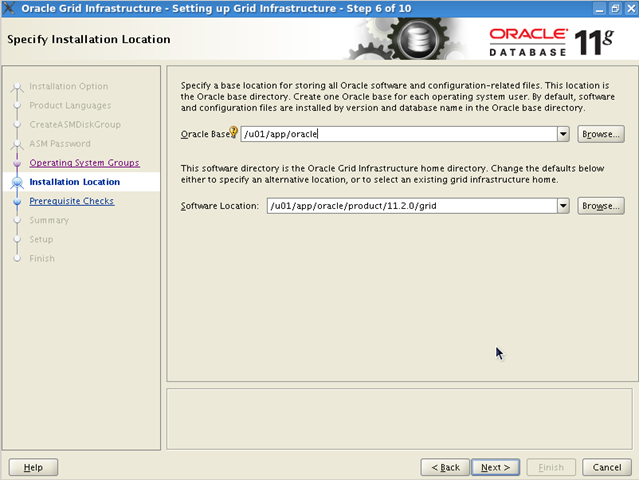 Set Oracle Base to /u01/app/oracle and Software Location to /u01/app/oracle/product/11.2.0/grid. Then click on Next >. 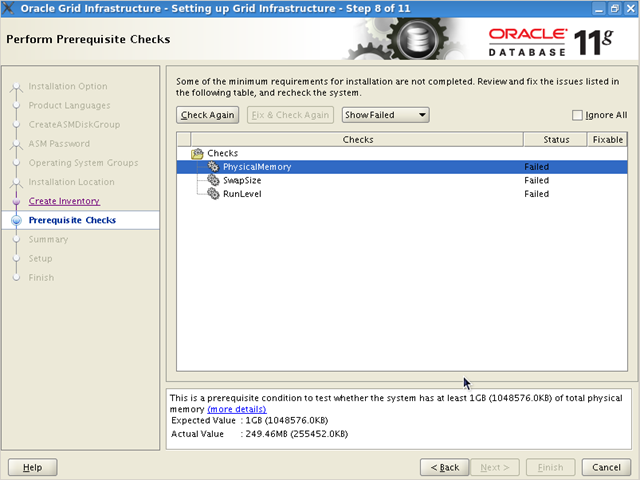 In this step installer will check the installation prerequisites as it does in previous releases. By 11g Release 2, if any of the prerequisites fail it will be reported in a tree structure with different categories. In my case majority of the kernel settings are automatically managed since I have installed oracle-validated-configuration rpm during OEL installation.Only problem seems to be insufficiently sized core.net.wmem_max which is defined to be the maximum socket send buffer size.When you click on Fix & Check Again button, installer will generate a single shell script for you to correct all fixable errors and after its execution it will recheck for any possible problems left. When the script is executed click OK to restart the prerequisite check process. As you see kernel parameter problem has gone. 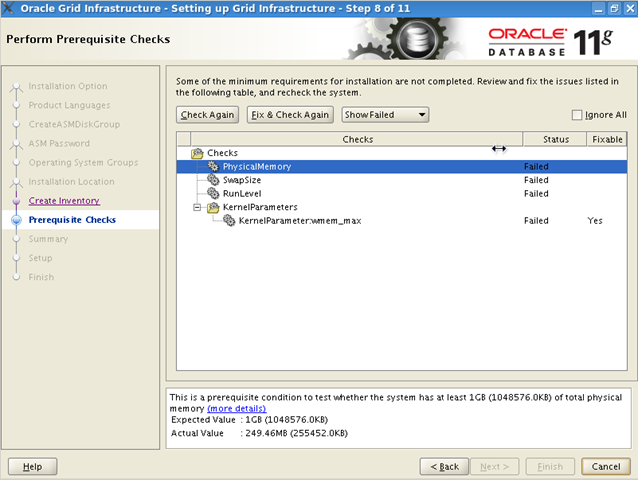 Other three errors can not be corrected by installer automatically, but we know that those are not critical ones. First one is PhysicalMemory error due to our VirtualBox 512 MB memory size. The second one is insufficient SwapSize that can be by-passed also for a play ground. And the final problem is RunLevel of Linux which is also not a great deal for us.Now check Ignore All and click on Next > (button will be enabled after checking out Ignore All) to continue. On the summary screen confirm that everything is ok and click on Finish to start installation. After installer successfully completes copy,install,link,etc steps it will pop-up a root.sh execution dialog. Run the required scripts as root. 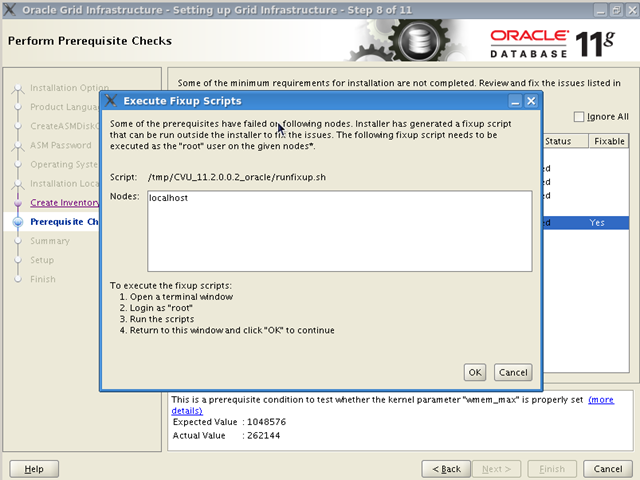 Then switch back to installation dialog and click OK in Execute Configuration scripts dialog to proceed. Final tasks for installer will be to configure new HA service for ASM, diskgroup (DATA) and the default listener (on port 1521) which will be automatically configured also . Finally we are done 🙂 Your ASM, default listener, and HA service is ready to be used. Service “+ASM” has 1 instance(s).